The Typist is a minimalist typography-centred theme. It includes selectable colour schemes, fonts, layouts, social icons and five different widths. Everything packaged in a clean responsive package. 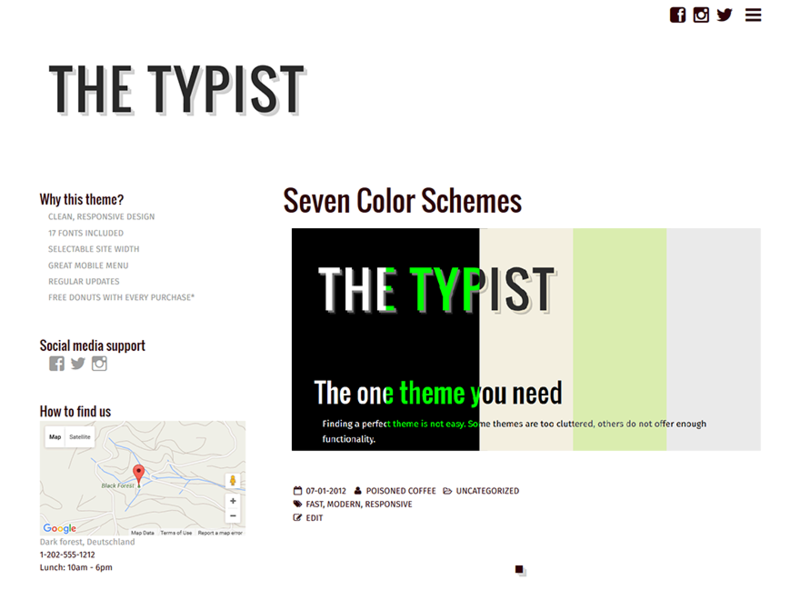 You can choose one of 7 available colour themes. From ascetic “Monochrome” to bright “Bubblegum”. Left sidebar, right sidebar, no sidebar. Typist does all that. Typist is customisable from admin screen. No manual html/css editing. Google rates it as “mobile friendly”. Menu is optimised for small screens. The Typist is free and can be used for commercial projects. If you want even more features and want to support me as a developer — consider buying the Typist Pro theme: premium version of this theme with user-selectable colours, breadcrumb navigation, featured images, incredible premium widgets and a year of support. I also offer paid installation and customization service for the Typist Theme. Simple installation and customization of my theme for your blog costs only $40 and will take 1-3 days. Use contact form below to message me. Mention that you want paid support and describe what exactly you want. I accept payment via PayPal.